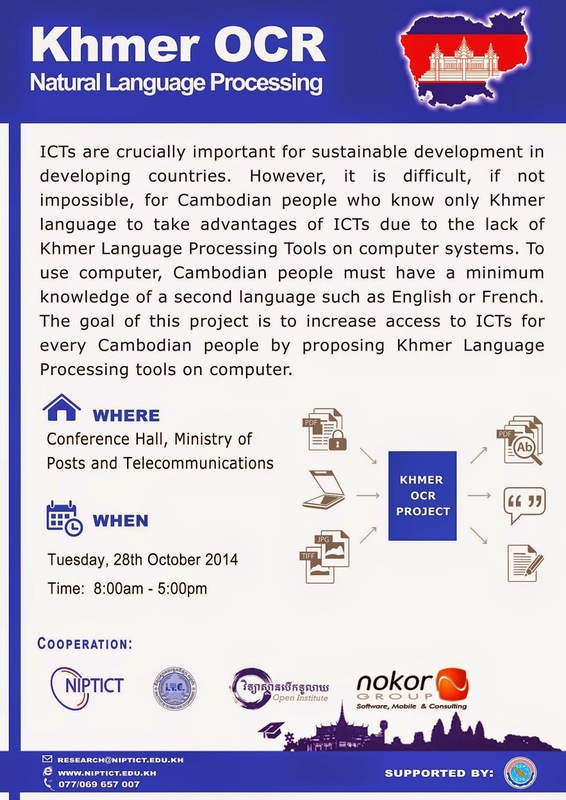 The event is now announced to public, the Khmer OCR conference which is hosting at conference hall of Ministry of Posts and Telecommunication. The OCR (Optical Character Recognition) software has been around in the world to convert the printed text on the image, pdf or scanned paper into the computed text or characters. Khmer OCR topic has been in the researching phrase long time ago with some researchers already but most of the case, each researcher is trying to solve different issue in the OCR technologies such in as in segmentation (line or character separation), recognition or classification etc. Now the conference is about to focus on producing the software that work for public uses, the invite all related researchers to discuss about different solution and TODO list for the next steps. The event is for invited person only, please contact the host: research@niptict.edu.kh if you would like to participate. The event only happens after some discussion and meeting with the team so far.